Spikeball is one of the coolest, most active and of course entertaining beach games you can play. It’s like beach volleyball but way more portable (similar to CROSSNET). 4 square and volleyball are the mother and father to spikeball. 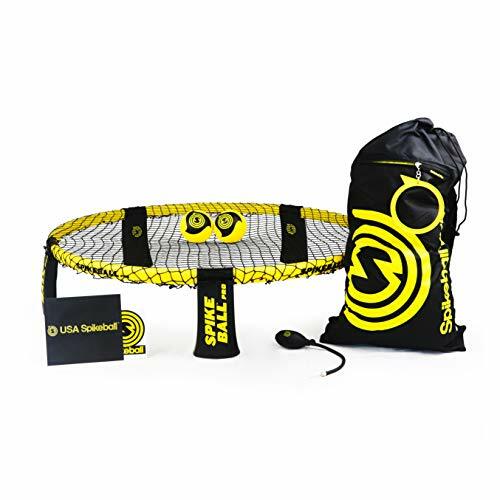 Spikeball is essentially beach volleyball with a round net that is elevated off the ground, but played small softball-size ball. Unlike volleyball where the goal is to get the ball over the net to the opposing side – the net in spikeball is actually USED to keep game play going. The low net acts as a sort of trampoline for the ball when you are spiking it to the other team. The prices in this post update, but also check out the Spikeball website. We listed some other variations you may want to check out below, but if you’re looking for the most cost effective option the standard set will be a good fit. The standard set is perfect for the majority of the people that will be playing this game. Comes with all of the high quality standard equipment, and of course a carrying bag so you don’t have to keep track of all the pieces. Let’s talk about these pieces a little bit more in depth.. The standard spikeballs have the design of a volleyball on the exterior, and feel soft in the hand. 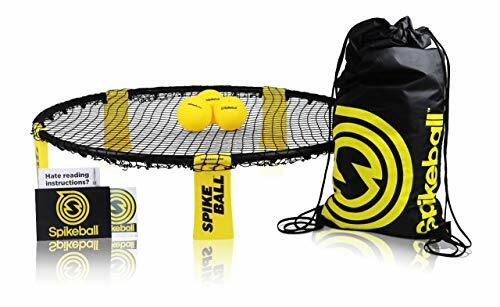 Spikeballs sport almost a squishy type feel, but this also depends on just how much you have the ball inflated. And…how much they are inflated is pretty important. Don’t completely inflate the ball. Make sure you leave a little ‘squeeze room’. You will be primarily hitting the ball with your hands, and an overly inflated ball took an unexpected bounce off of our palms and hands many times during game play. You receive 5 of these with any set you purchase. These legs elevate the net off the ground so you can actually use the net for what it was intended – spiking the ball off of it. One thing we really likes is that they won’t wear down in the sunlight, or get ‘weaker’. This is a major comparison that spikeball had over slammo and battle bounce (two of their competitors). But honestly they aren’t really competitors. 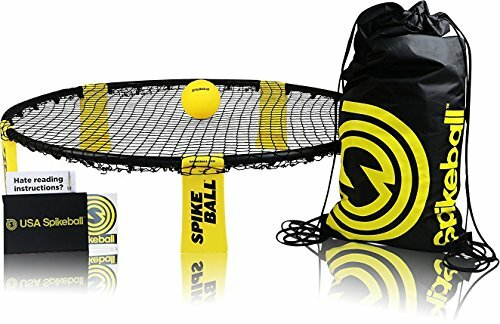 They have much lower quality products than spikeball. We left both of them off this post. You can see that the legs have a passage way through the top. One plastic rod will come through one side, and the connecting rim will come through the opposite side. Once you put the rods in place within the leg they make sort of a ‘click’ sound so you know you didn’t mess it up. Rather, if you have a newer version of a spike ball set then they WILL fold. Folding Legs are important for 2 reasons..
Once you are finished playing, and you don’t want to break down the entire set you don’t have to. Simply fold the legs to make it flat, and store it away. Lays down flat in a car trunk too. If you REALLY get into playing the game – things can get crazy. Once someone falls on the set (they will) the folding legs keep it from breaking. This is actually more common than you would think in a fast pace game. The rims hook into the legs from either side to hold it into place. And depending on what version you have (game versions mentioned below)…the hooks for the net can be placed in different areas in the set. Version 3 is more common now that spikeball has improved their game set. Most noteworthy – the rim on the pro set listed below is much ‘beefier’. Just hook the net up ‘pretty tight’ right? NO. You want the net TRAMPOLINE tight!! Attach rim into all 5 legs so you have an empty space where the net goes. Once it’s laying in the center you are going to want to connect to the net to the 2 hooks that are at every single leg. From there…continue to hook the net to ALL of the other hooks on the rim. Make sure once you hook one side, you hook the opposite side consecutively. Feel like it’s tight enough? Give the net a little ‘test slap’ like your hand is the ball. Did your palm spring back up? You’re good to go. If it didn’t you need to pull the net tighter in areas around the rim where it’s needed. The rules are as difficult or as simple as you make them. Watch this official video from the Spikeball team on how to play. Don’t have time to watch video? Scroll down for a quick summary. For some yes. Just keep in mind this game requires a LOT of athletic ability. If you aren’t the type to be moving around too much you might want to check this game out. When serving in Spikeball you can’t slam it DOWN so that the ball goes over the opposing players head. That would be the equivalent of hitting it out of bounds in beach volleyball. No double hits (just like volleyball) – Additionally, if the ball hits for example your shoulder…you can’t hit the ball after it hits your shoulder as your shoulder is 1 hit already. This game is best to play on the BEACH as there will be a LOT of diving if you’re serious about competing. It’s also meant to be played in the grass or say on a basketball court if you have access to one. As long as you have a place with plenty of space to move freely where no one will get hurt. Spikeball games are played to 21 points (win by 2). They can also be played to 11, or 15 only as well. Depending on how long you’d like to play for. You and your teammate are awarded points when the ball touches the ground or otherwise isn’t returned by the opposing team within 3 touches. Aside from the standard set we mentioned at the top there are 3 versions of this set. The most common you will most likely see is Version 3 as Spikeball continues to update their products. Version 1 had hooks on the yellow legs and hooks on the black rim that could move or shift. The Spikeball combo meal is identical the standard set with the exception of 2 extra balls. This can be good if you have a dog that like to make chew toys out of your stuff. This way you have 2 extra backup balls. In our opinion this set looks the coolest, and performs the best. It’s more expensive, but you do get what you pay for if you feel like you will play this game often. Inverted Colors – helps you stand apart from all of the other spikeball players on the beach. Not only that – it helps you see the rim easier out of your peripheral vision once you are in a fast paced game. Rim – 33% stronger for less wear and tear. You can absolutely tell these rim pieces are beefier than the standard set. Balls – The spikeball pro balls are WAY nicer than the standard. They have dimples on the surface for easier grip, and they have the spikeball symbol on them in black so you can tell the spin of the ball. The RING – The ring on the backpack isn’t just so spikeball can have their symbol be ‘more than obvious’ here. Yes it’s used to close and open the zipper, but what many people don’t know is it’s for checking the size of the ball. If the ball barely passes through the ring without touching the sides then you know your ball is inflated perfectly. This set is perfect for the serious player in you. Can you picture yourself competing in this sport? If so we definitely recommend this kit. It includes a total of 13 spikeballs. 11 of them are standard, and 2 of them are glow in the dark for night time play. Spikeball has a HUGE fan base, and player makeup. More than 250,000 players and 1000 nationally (US) ranked teams. Here’s a link if you’d like to check out where you can enter into tournaments after you’ve become a pro spikeballer. Spikeball events are getting more and more popular across the US. This game is for true competitors. If you like to play beach volleyball at a quick pace, and don’t mind getting a great workout in the process this game is for you. 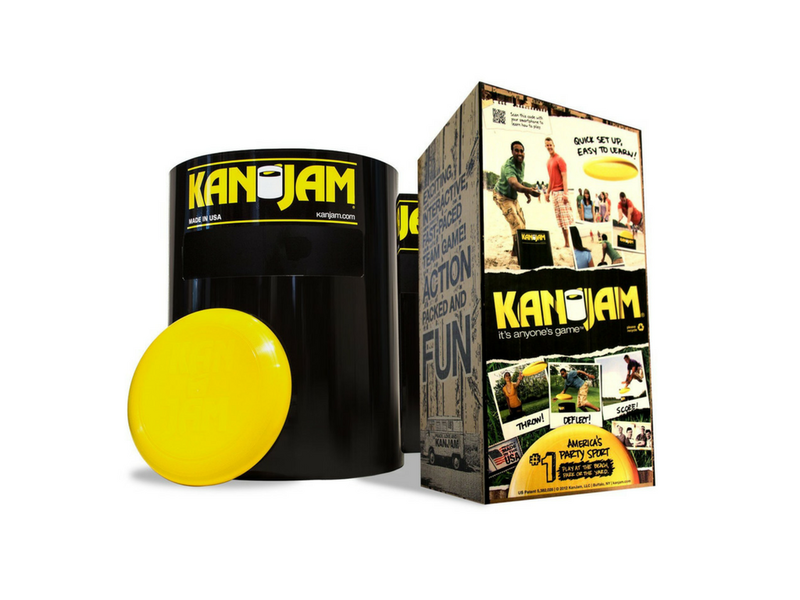 Spikeball is also a great gift for the entire family if yours is the competitive type.